Yeshiva Ketana Ohr Reuven is the elementary school division of Yeshivas Ohr Reuven. The yeshiva is under the direction of Rabbi Bezalel Rudinsky, Rosh HaYeshiva, and Rabbi Benzion Brodie, Sgan Rosh Yeshiva. Yeshiva Ketana Ohr Reuven is founded on the fundamentals of Ahavas Hashem, Ahavas HaTorah, and Ahavas Yisroel. We at YKOR are committed to infusing our Talmidim with the skills that they will need to succeed in life. At YKOR, we work to foster a lifelong curiosity and love of learning that instills within each child a sense of self-esteem and self-worth. YKOR is committed to providing an excellent education in both Limudei Kodesh and General Studies. 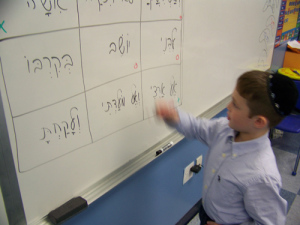 Enthusiastic Rabbeim and teachers use innovative, skills-based learning techniques that stress a love for learning and an appreciation of life. Imbuing our Talmidim with Middos Tovos and Ahavas HaBrios is of paramount importance. Inspiring our children today to meet the challenges of tomorrow! Yeshivas Ohr Reuven (all divisions, including Yeshiva Ketana Ohr Reuven formerly Yeshiva Darchei Noam) admits students of any race, color, national and ethic origin to all the rights, privileges, programs, and activities generally accorded or made available to students at the school. It does not discriminate on any basis of race, color, national or ethnic origin in administration of its educational policies, admission policies, scholarship and loan programs, and athletic and other school- administered programs.